Amazon.fr has been offering #70322 Axl's Tower Carrier at a very good price for quite a while now: 37,49 €. That's 56% off the French RRP of 84,99 € or 58% off the Belgian RRP (89.99 €). Prime only but you can get a free 1-month trial membership, benefit from the price and and cancel right away. Some Dimensions Fun Pack (e.g. Legolas) reduced to EUR 3.80; most remaining Year 1 Fun Packs around 50% off. Thanks you! Already have that pack from Auchan @15 ;€ but I noticed some other packs were reduced to my desired price point for Dimensions sets (about 50% off RRP) as well. Got the ET and Wonder Woman fun packs for 5,28 € and 4,90 € respectively and the Kai & Cole Ninjago team pack for 9,69 €. 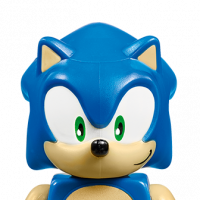 #71244 Sonic Dimensions Level Pack now down to 14.99 - possibly some more Dimensions discounted, I didn't check. ^ Quite a few of them are discounted. Made me patch the last holes in my collection: I ordered The Simpsons level pack for 9,73 €. Fun packs: ordered Ninjago Jay for 4,90 €, Bart Simpson for 4,73 € + Stay Puft and Cyberman for 9,06 € each. Most other team pack are about 13 €; Ordered the Scooby & Shaggy one and Adventure Time at that price. Story packs for 22 €; got the TLBM one. Only story pack I'm missing is the new Ghostbusters one; mostly because I did not really like the remake movie. #75157 Captain Rex's AT-TE now EUR 67,98. Prime only, back-ordered with a 2-5 weeks shipping estimate. 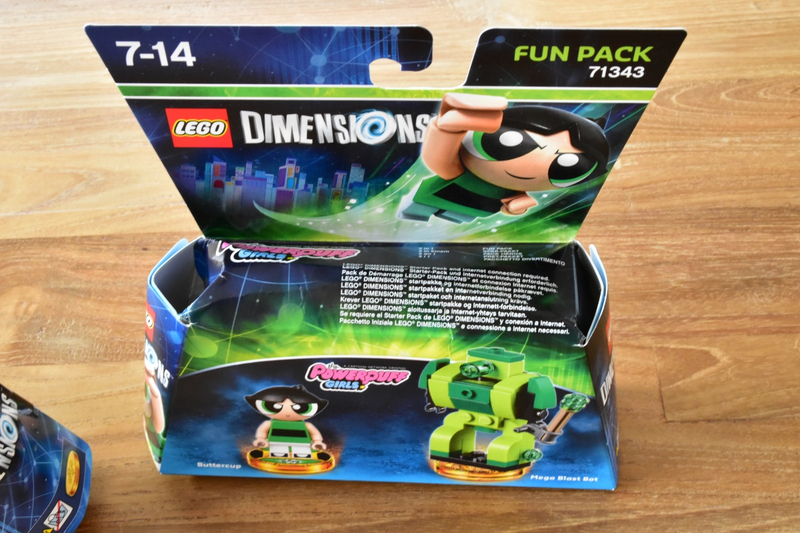 EUR 14.62 for Dimensions #71264 TLBM Story Pack. #70317 Fortrex for 34,99 € (35,28 € delivered in BE) at Amazon.fr. Prime only but you could get sign up for a free month and cancel right away. Not a LEGO set, but Amazon.fr has a rather nice LEGO Star Wars Death Star ZipBin on offer as flash sale. Sales price is 16,28 € (RRP 45 €). Flash sale price valid for another 15 minutes. ^ Scratch that, I bought it. #41313 Heartlake Summer Pool almost 50% off at EUR 25,73. Not limited to Prime either. for the uk with shipping that workout to about £30 give ot tack a little. #70357 is 80,73 euro - that's 43% off Belgian RRP. My son will be happy at Xmas for this. Might go lower at the end of it's lifetime (like the volcanic lair etc but then I don't think he will want to miss out). So for those of you in a similar situation, thought I'd post ;) It's not limited to prime. ^Oooh! Bought. Delivery next Wednesday. On my son's birthday. While we're having a Nexo Knights themed party for his friends! BTW, no-one to blame but myself for buying sets @snowhitie. Contemplating the #70612 Green Ninja Mech Dragon for 36,99 € @amazon.fr. Not that impressive looking at the numbers only, especially compared to the French/German RRP of 49,99 € but lowest it's ever been in these parts and about 32% off when comparing to the Belgian RRP of 54,99 €. considering the temple and destiny bounty were both 33% off, it's not that impressive. now, something else that interests me is extreme adventure, it was 34% off I think, 95€, pretty tempting for over 2300 pieces. #60155 City calendar is 12,07 €, #41326 Friends calendar for 11,28 €. City calendar on backorder untill 25/11, for the friends calendar you have to select the "other vendors" to order from Amazon. #71344 Excalibur Batman is 4,42 €. Anyone have a idea what the average delivering time is from amazon.fr to the netherlands? Want to buy the advent calendar for my nephew + niece as its a lot cheaper there but i am scared it wont be in my house before 1st of december. To Belgium it varies, 1 day to 1 week. @Kokkie20 It's going to be touch and go but have a look at what Amazon is quoting. If you already have an Amazon account from an earlier order, even on another Amazon site, try to go until the last step before confirming the order. You'll get Amazon's delivery estimate based on the planned logistics of the order - something we don't have - and from experience I'd say that's very likely the delivery plus or minus a day. I'd say the average is about five days but that's not going to help you much: Amazon is not your typical retailer and Amazon.fr does not ship from a single large warehouse in France. Instead, Amazon storefront orders (say .de .fr .es .it etc) can be fulfilled from all over Europe. Latest and last wave Dimensions sets are randomly discounted by Amazon.fr this week. Yesterday it was #71349 Beetlejuice for 7,25 € but now that set is at RRP again. Thank %Deity for my prime subscription as I ordered them all individually. If you're looking for things to add until free shipping treshold, most SW battle packs are below 10 €. ^They are indeed. Don't remember seeing that yesterday but not absolutely certain the limitation wasn't there either. But hey, before this happened again Amazon managed about two dozen LEGO deliveries that were well-packaged and consequently arrived in mint condition or with just small creases. I had one packed in their regular book-papers and it came out pretty much spotless - my daughter and I uttered a collective "wow!" when I took it out. Magic does exist! In addition to the sets listed by @kerre, Amazon FR has some nice discounts on other sets as well. And best of all: not limited to Prime members. ^^ #31069 went back up to 35 €, others are still >50% off. ordered the goblin village. there is quite a bit of tempting stuff, though stuff I wouldn't have considered if it were less than 40% off, so yeah maybe better to keep money for 2018 stuff. #42062 Container Yard for €29, about half price. Amazon.fr is price matching FNAC.fr on a number of sets resulting in some deep discounts on LEGO Star Wars. I'll limit myself to the lowest price ever ones - #75202 Defense of Crait for €51,19 #75209 Solo's Speeder €19,59 and #75200 Ach-To island for €18,47. Battle packs #75198 (Tatooine), #75197 (FO specialists), #75206 (Jedi and Clone troopers) and #75207 (Imperial Patrol) all €9,91 each. Unfortunately the Brickset Amazon prices aren't updated yet :( but remember to use the affiliate links on the site when buying please! Currently n/a, but will be delivered once in stock. Good enough for me. That's the affiliate link for another site. No Brickset affiliate link available yet for #60200; I guess the bot has not yet picked up this June 01 set. 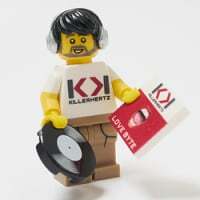 However as far as I'm aware you don't need a direct Brickset affiliate link to support the site. If you click on any of the affiliate links here on Brickset, e.g. this one for #31081, and then buy something else on Amazon, Brickset will still get a cut to help with the upkeep of this site. ^yup, that's what I did, just use any set to go to Amazon.fr and then search for it. That was a quick discount though, wonder if it will actually go through. Thanks for the headsup. It's a new set. If you put an order in to buy from Amazon.fr direct, it's almost certain you'll get the set. Amazon does not know when they will get the item delivered to their warehouses but does expect these in at some point - see here for a primer on Amazon's sometimes cryptic stock indications. The option to buy order direct is hard to find in a number of situations where the item is temporarily out of stock. There's a reason for this: Amazon tries to placate their resellers (but just a bit) because it's hard to compete with the giant's agressieve pricing policies. Why even bother to sell on Amazon when you're guaranteed to be undercut by Amazon? A situation like this offers a small window of opportunity to flog their wares. Please do note: what looks like exactly the same can happen to retiring sets. Amazon lets you still place an order for sets not considered EOL in their system as it expects more stock to come in at some point. Often supply does dry up in these cases and your order can stay open for years after the set has retired. Amazon will dutifully send an update every few months and you can occasionally mention you're still eagerly awaiting your set on Brickset! Welp, that's one purchase I didn't anticipate because of the RRP.. :-) Thanks for the pointer! Did u get anymore road plates @ Kruidvat lately? 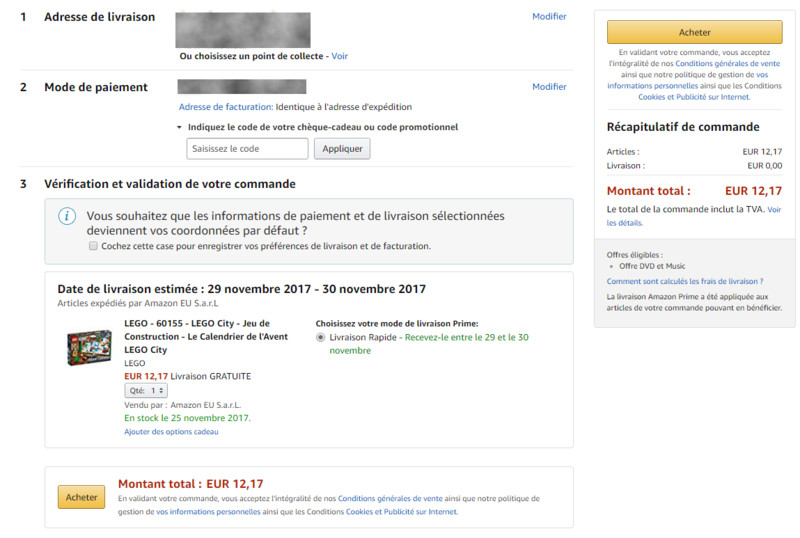 Nous vous contactons pour vous informer que nous avons annulé votre commande car le prix de l'article Lego City 60200 Capitale (ASIN : B07BLGD9YV) était manifestement erroné lorsque vous avez effectué votre achat sur Amazon.fr. Soyez assuré(e) que votre compte bancaire n'a pas été débité du montant correspondant à cet article. Si vous souhaitez toujours acheter cet article, veuillez effectuer une nouvelle commande en ligne. Dès que votre commande sera prête à être expédiée, nous débiterons le bon montant de votre carte de crédit ou de débit et vous l’enverrons. Amazon.fr met tout en œuvre pour que chaque client bénéficie d'un service de qualité irréprochable et des meilleures offres. Nous vous prions de bien vouloir accepter nos excuses pour le désagrément causé et vous remercions pour votre compréhension. We are getting in touch with you to inform you that we canceled your order since the price of the Lego City 60200 Capital (ASIN: B07BLGD9YV) item was clearly wrong when you made your purchase on Amazon.fr. Be assured that your bank account has not been charged the amount corresponding to this article. If you still want to buy this item, please make a new order online. As soon as your order is ready to ship, we will debit the right amount of your credit or debit card and send it to you.